Thank you. Will be in touch. today's special 2 person walk-on rate. 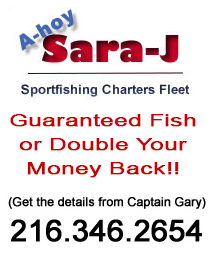 Put Captain Gary's 30+ years of fishing to work for you on your next Lake Erie fishing trip. Our Heated & Air conditioned, large, stable and comfortable King Cat Catamarans are the ONLY WAY to ensure EVERYONE has a GREAT fishing trip!